Please call (02) 8041 5244 to organise Returns or Warranty Claims. Natural variations in the colour, texture or grain pattern of the wood or MDF are not to be considered defects. Doors must be accorded reasonable treatment by the purchaser and should be stored or hung in dry buildings and not in damp, moist or freshly plastered areas. The utility or structural strength must not be impaired in the fitting of the door, the application of hardware, or cutting and altering of the door for lights, louvres, panels or any special details. A maximum of 3mm may be trimmed from any edge of the door. This must be done evenly. Normal “showthrough” of frame components in doors shall not be considered a defect. Entrance/solid doors up to 2040 x 820 require three hinges, larger doors require four hinges or pivot system. ENTRANCE DOORS SHOULD BE HUNG IN WEATHER PROTECTED AREAS. not assume responsibility for doors which become defective because of failure to follow these conditions or hazards of shipment or storage, after doors leave the control of the Company. The Company will not be liable for any costs, claims, damages or demands arising from the personal injury, loss or damage whatsoever occurring to the customer or its agents, servants as a result of either acts or omissions of the customer. The Company will not be liable for any consequential loss or damage, whether due to its negligence or otherwise. The Company will not be liable to the customer for the Company’s failure to comply with its obligations to the customer due to any cause beyond the Company’s reasonable control and the Company’s obligations affected by such cause are suspended while the cause continues to prevent or hinder the Company’s performance. Considerable damage can occur during the delivery of doors particularly to country areas. “Special Packaging” is recommended (optional extra cost) in an attempt to prevent transit damage. The Company is not responsible for any transit damage. Warp shall be interpreted as meaning the cupping/bowing or twisting of doors. It refers to distortion within the door itself and not its relationship to the jambs or frame in which it is hung. Warp exceeding 5mm for doors up to 2100 x 920mm, 6mm for doors over 2100 x 920mm and up to 2340 x 920mm and 8mm for doors up to 2340 x 1200mm shall be considered a defect. Doors in excess of 2340mm high or 1200mm wide are not guaranteed against warp. a. 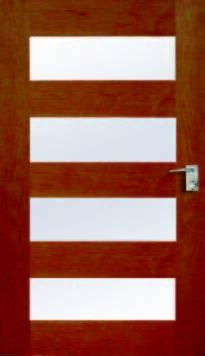 Doors with face veneers of different species. b. Doors that are improperly hung or do not swing freely. c. External flush doors which have been painted or stained dark colours, or different colours each face. Experience has demonstrated that when warp occurs after doors have been delivered to storage or building sites, it is usually due to improper storage or adverse moisture conditions after hanging and not to faulty manufacture. The Company will accept no responsibility for doors when moisture content of the timber falls below 12% or exceeds 18%. The Company will not accept responsibility for conditions wholly beyond its control. However, the Company should be consulted promptly if excessive warping occurs to provide assistance in overcoming the difficulty.